BOSTON — The party's over for Rob Gronkowski. Then again, it might just be getting started. 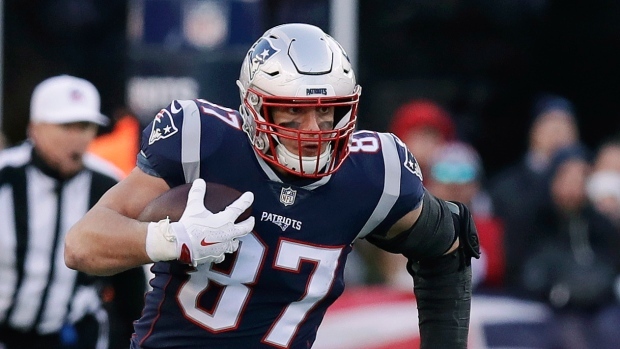 The playmaking tight end, who turns 30 in May, leaves as a three-time Super Bowl champion who established himself as one of the most dominant players at his position and one of Tom Brady's favourite targets. His personality — on and off the field — was as big as his biceps, and he always seemed to be the life of the party. A fan favourite in New England for his gregarious and playful persona that included awkward dance moves and touchdown celebrations, Gronkowski was one of the most dominant tight ends of his era. His 12 career post-season touchdown receptions are the most by a tight end in NFL playoff history. His 81 career post-season catches are also best among tight ends.